We finished February out well and were ready to move on to the warmer weather of March! Apparently we still had some snow and ice to deal with in the beginning of the month and the kids were even out of school for three days because of the weather. Snow and ice are really not normal for Memphis, especially in March!! We didn't have any snow to play with but there was a lot of ice on the roads because the temperature kept hovering right around 32 degrees for several days. We didn't complain because we had lots of fun at home...sleeping late and making huge breakfasts for lunch. The following week was Spring Break and since we were staying in town, we decided to heat up the pool and have a little backyard fun! Swimming For The First Time Since Last Summer! It's A Good Thing Everyone Remembered Because I Did Not Want To Have To Jump In! Ingram The Fish Is Definitely Back! We drove up to Jackson during our Spring Break and took Grandmother and Mimi out to lunch at Olive Garden. The kids were hyper and were giving Mimi and Grandmother more noise than they bargained for in our close quarters. After lunch we made it to Carley's Volleyball game and watched her play before we had dinner at Mimi and Pop's house and drive back home. Now That Just Looks Like It Hurts! Ingram Needed A Little Lindsey Help To Do It To Madison! Ingram And Lindsey Earned A Build-A-Bear Trip For Work Around The House! G-Mommy and G-Daddy came in town and we went to Osaka for the first time and sat at the Hibachi tables. Our Chef was quite entertaining and almost lit the restaurant on fire (I'm kidding...but the flames were huge!!) putting on a show for us. Everyone loved it and I think we might have found a new favorite restaurant! "But I Want To Use Chop Sticks Like G-Daddy!" Yes, That Would Be A Little Too Much Fire!!! And We Finished Spring Break Off At The Movies! We ended our Spring Break weekend with the kids meeting some of their cousins from Wichita, Kansas for the first time. The Rose and McCue crew came in town for a family wedding and we had a swimming party at our house while the weather was still nice and the pool was still heated. The next morning Lindsey and Daddy ran a 5K race as the temperature was starting to drop and rain a little. Only about one hundred yards in to the race, Lindsey decided to leave Daddy and wound up running a pretty fast race! 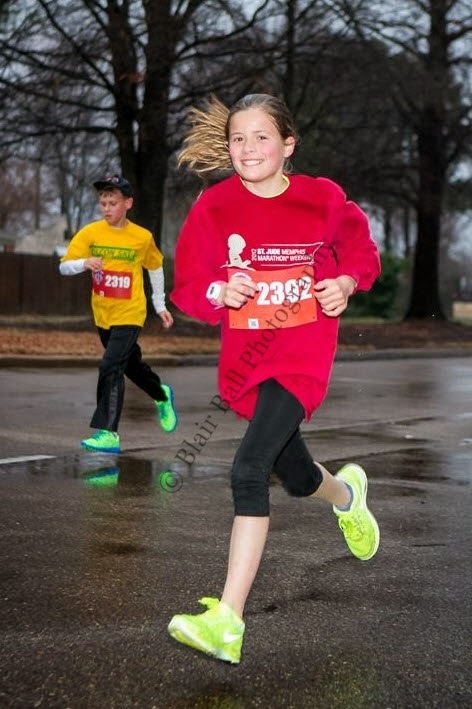 She brought home the First Place Award for her division and was on Cloud 9 since she had planned on winning her division at the St. Jude 5K back in December. Both Feet Off The Pavement...That's How It's Done! Next we all headed to Jackson for Uncle Butch and Sybil's wedding and for all the kids to hang out and play again during the reception. After the wedding we came home and decided to use the pool one last time before we turned the heater off since Spring Break was officially over. The bad part of that decision was that day the temperature dropped drastically again and when the Daddy and Ingram got in it was 40 degrees outside but 80 degrees inside the pool! The rest of us got in and then they laughed because it felt soooo cold; we stuck it out for a while, but then all headed inside to warm up and go to bed! All The Cousins Lined Up In Age Order! That Ingram Picked Out For Himself. The Oldest (And Tallest) One Was A Baby At Our Wedding Almost 16 Years Ago! Ingram also had his first T-Ball game of the season this week and he was the cutest thing! He was all decked out in his Washington Nationals uniform and even had Tyler Moore's number on his jersey. He was super excited since Mr. Brent knows him and said his new bright yellow cleats would also help him run "100 fast" to all the bases. Ingram has been asking every day if today was the day for his game and we finally were able to say YES!! He even wore his uniform to Madison and Lindsey's soccer tournament and showed everyone his new cleats that he got from the soccer store. To say he was excited is a bit of an understatement! Getting Some Pointers From The Big Boys! He's The Only One With Muddy Knees And Bright Yellow Cleats! Yes, And He Hit It Off The Second Pitch!! It Was Time To Make A Dirt Pile! Daddy and Ingram went on a special "Boys Only" trip to New York City and left us girls at home. Daddy had a work thing on Fox Business scheduled and ALSAC asked Daddy and Ingram to speak at a "Thanks and Giving" luncheon the same afternoon. Daddy had been warned about how energetic and talkative Ingram would be, but I think he was still in shock at how accurate our warnings had been. Before their plane even took off, Ingram had pretty much met the entire plane; he invited the five rows around him to come to his house when they got back and even told them his address. It's a good thing he has such good people skills (thanks to St. Jude) and for learning his address (thanks to his GBC teachers) because I'm sure those were put to good use! I'll Introduce You To Everyone On The Plane! Lunch Of Champions In Between Flights? Riding In Style...And Without A Booster Seat?? He Must Learn His Posing Skills From His Big Sisters! FaceTiming From The Hotel Room! The T-Rex Is Going To Eat You!!! Toys R Us In Times Square Is The Best...Three Stories Tall With A Ferris Wheel Inside! Don't Mess With Ingram And Hulk! He's Wearing Green For Team Ingram! And That's His First Remote Control Helicopter And Its' AWESOME!! Ingram conked out at 8:30pm after a super fun day of traveling and going to the Toys R Us store with Daddy; he slept untill 8:40 the next morning. Once they left the hotel after breakfast, they had even more fun at the Fox Business Headquarters and at the "Thanks and Giving" luncheon. Daddy, Ingram, and Caitlin (our amazing ALSAC host) spent a couple hours at Fox Business in the Green Room and on the set of Opening Bell with Maria Bartiromo. To say Ingram loved being the center of attention with Caitlin is an under statement, but he behaved the whole time. While Daddy was on the set for work, Ingram and Caitlin hung out in the Green Room and also got to see Daddy on the set. Afterwards, Ingram got to meet Maria Bartiromo and he was of course being goofy and entertaining as usual. Happy Smile From Good Sleep! Good Luck With That Hair Daddy! Ingram "Working" From The Green Room While Daddy Is On The Set! Was On The Fox Business Set! Daddy And Maria Bartiromo On Opening Bell!! Like I Said Goofing Around And Playing Hard To Get! Ingram With Maria Bartiromo In The Green Room After The Show! Next they headed to the Thanks and Giving Luncheon where Caitlin again saved the day for Daddy. Ingram loved hanging out with Caitlin and they played Hide and Seek, played on the iPad, and found some food for Ingram to eat for lunch while Daddy was speaking to the CEO's of the various companies that participate in the Thanks and Giving Campaign and telling our St. Jude story during the program. Ingram also got to see Mr. Shadyac and Mrs. Marlo (what he calls Marlo Thomas) and was as well behaved as he could be going into the fourth hour of "adults talking." Own Mini Sandwiches Out Of Toast And Ham. Add In An Apple And A Chocolate Chip Cookie And It's A Gourmet Meal! A couple hours later and the boys were on a plane headed home to Memphis! We were soooooo excited to see them when they got home that we stayed up extra late on a school night!!! Ahead Of Daddy And Is On The Plane Already! I Have To Say I Was This Excited To About Them Coming Home! From The Plane Headed Home...Of Course, It Made Me Cry! Ingram Was Determined That He Could Help Carry Their Luggage Through The Airport! He Realized That His Belt Was The Perfect Resting Spot For The Handle. So everyone knows we root for Florida in sports and with March Madness rolling around, it's a given that we would love to see them win! Daddy and Ingram were able to go to the Sweet Sixteen game at the Fed Ex Forum to watch our very own Gators play in the tournament. The only down side to going was that they actually left the house at the same time I was putting the girls in bed and Ingram soooo needed a nap that day! They had a blast and loved watching the game; I guess I should say Daddy loved watching the game because Ingram wasn't too impressed with it for some reason (we'll blame that on him being 5). Instead of making it to the final buzzer, Daddy decided to take Mr. Sleepyhead home and put him in bed so that he wouldn't be too grouchy the next day and finished watching the game on TV. Yes, He Would Be Asleep In The Car With His iPad Playing! He Takes After His Girls! Even though it looks like we've had fun this month, it's still been a rough month within our Cancer family. We have lost several friends with our same type of tumor and with other types of cancer too. We've had friends find out about recurrences and also dealt with our own emotions with Ingram's cancer with his "First Headache" approached on March 29th and as April 3rd approaches. Even though we are right at 2 years from the beginning, some of it seems just like yesterday and our lives are forever changed because of Ingram's cancer. He still thanks God every night for taking his tumor away and asks that his cancer never comes back every night. Please remember to pray for everyone affected by Childhood Cancer, especially the patient and their families.